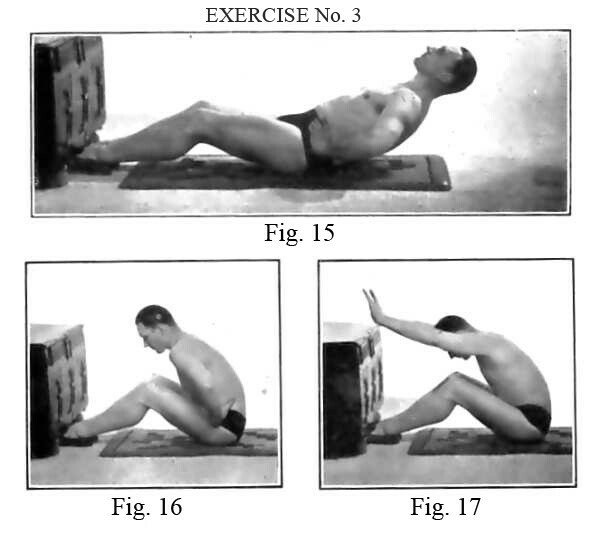 Muller’s Famous Sit Ups – Learn JP MÜLLER'S 15-Minute Full Body Workout "MY SYSTEM"
When JP Muller first started advocating sit ups, there was no common name for the exercise, he called it, “Trunk Raising.” Below are the instructions for his famous style. You’ll note that in these, you keep the back completely straight. This style is still commonly used by weight lifters and in some Pilates exercises. Instructions: Lay on your back in front of a heavy piece of furniture and put the front third of your feet underneath (a little more than the toes). All muscles of the neck, shoulders and back should be relaxed. Fill the lungs completely and exhale while raising the body to the forward-leaned, sitting position by means of pulling with the feet and using the abdominal muscles. The whole upper body is moved as one piece, keeping the head in its natural position and using the hip joint as the axis of rotation. Without pausing, inhale while lowering the body backwards. While in the resting position fill the lungs completely once more, then raise the body the second time, make sure to exhale while raising your body. Editor’s note: in this first degree, you may keep your hands and arms at your sides and use them to help raise and lower yourself if needed (not pictured). It is a bad mistake to raise oneself with a jerk, or push, with head and shoulders, or to roll the body up. Don’t stick the chin out, duck the head or draw in the abdomen, when the body is lent forward. Rather seek to distend the stomach between the knees. If your abdominals are properly engaged as the body nears the floor, and the abdominal muscles gradually contract, you will hardly be able to get more air. Instead of committing the error of holding the breath, you should immediately commence exhalation and finish the same lying on the floor. During the body lowering you also use the hands and elbows as supports; but refrain from throwing the head or eyes back or bend the chin on to the chest.